Back in the old days, they put a nail in the mantle to hold stockings. I don't do that, it's too destructive. Now we use these heavy, decorative stocking holders that sit on your mantle with a little hook for your stockings. The problem? They are a bit expensive. A set of four is like $25! The stocking hangers I have are from approximately 2006. I purchased three of them, one for each of us, the kids and I. From the Dollar Tree. For $1 each. Quite a steal! Then Matt and I moved in together, and now we had four stockings. And also one of our three hangers broke. I needed another option, but couldn't find any more Dollar Tree finds. And I wasn't about to put nails in my mantle. So I scotch-taped them. Which worked sort of, but they fell often, and once there was stuff in them, they were on the ground. I found a $.57 wooden dowel rod at Walmart, painted it white, and strung all our stockings on it, including the ones for our pets. I propped it up using the two stocking hangers I had left. Super inexpensive solution for our stocking-hanger-shortage situation! I also put together these decorative jars, by filling them with extra ornaments and adding some bows (also from the Dollar Tree) to the front. Yay for cheap Christmas decorations! What a great idea! I've never seen the rod idea, but it definitely works well to hold the stockings up. Your mantle looks great! Such a clever idea! I'm thinking this may have to happen at our house next year. So clever. Genius! And for less than a dollar!? Thanks for linking up! Thanks for the compliment on my ornament wreath! I really like your rod idea! So neat! How smart! It looks great too. Thanks for joining the Dare to DIY! YES!! I have been racking my brain for a simple, easy solution for our stocking this year. 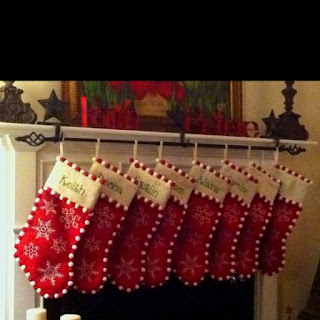 We have four hung with the mantle clips but we had a wonderful addition to our family this year when baby girl arrived in June and with stocking hangers being $20 plus dollars and making one with nails, paint, etc seems like too much work, this is a brilliant alternative!! yes! perfect! I'm going to check the thrift store! thanks!